The Balanced Scorecard is a business framework for tracking and managing an organization’s strategy. Based on the balance between leading and lagging indicators, the framework tells us about the gap between the company’s drivers and its desired targets. Are you meeting your goals? Are you on the right track to achieve future goals? See how much your company has accomplished. The system connects the dots between big picture strategy elements like mission, vision and the more operational elements such as short term objectives, measures future targets, and initiatives to reach those targets. In for-profit organizations, financial measures provided a lagging report (stated what happened last month, quarter, or year), but they were not able to look forward. It was in the year 1992 that Dr. David P. Norton and Dr. Robert S. Kaplan started a working group to specifically look at measures that are forward looking and act as leading indicators for an organization’s strategy. Financial goals – Financial goals to impact an organization. Customer goals – Things that are important to our customers, which will impact our financial standing. Process goals – what to do internally to meet our customer goals, that will impact our financial standing. Employee goals – Skills, culture, and capabilities we need in our organization to execute processes to make our customers happy and impact our financial bottom-line. Strategy mapping ensure that your strategy is successful. These maps capture and communicate your strategy, precisely to the employees in a succinct manner. Because the company cannot truly flourish when the staff is unaware of its core strategy. Strategy mapping, using the Balanced Scoreboard Framework, will enable each of your employees to know how they are performing and what they can do to realign and enhance their performances. When you come to a decision about desirable outcomes, strategic KPI’s will help to monitor the effectiveness of your company. They will underline people effectiveness by determining the gap between actual and targeted performance levels. This strategy creates line-of-sight that everyone in the company, (from top to bottom) can see the difference between work they are doing and the results that are they are targeting. It underlines where and how much they are lacking and also suggests the action plan that they can undertake in order to overcome obstacles and shortcomings in order to meet the desired results. The scorecard is first and foremost used to guide people at the quarterly business review to promote organizational learning and improvement over a continuous period of time. Philips created its balanced scorecard with the knowledge that getting a grip on what drives present performance can be the basis to improve future outcomes. Employees are instilled with the management’s strategic policies by making it easy to understand and internalize. Philips created four critical success factors (CSFs) as the indicator to show business success. It has to align indicators that measure markets, operations and laboratories with business success. At the business unit level, six key indicators are also included under each CSF. How the typical Balanced Scorecard is used? Bring an organization’s strategy to life: Those in the company can then use this strategy to make decisions company-wide. To communicate the strategy across the organization: The strategy map is critical, organizations print it and include it in interoffice communications, put it on their intranet, communicate it with business partners, publish it on their website etc. To track strategic performance: That’s typically done through monthly, quarterly and annual reports. 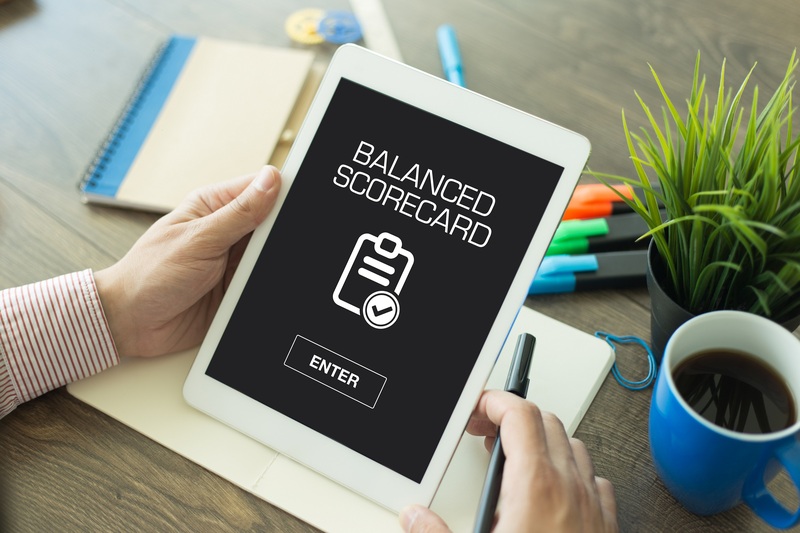 We’ve seen everything from numerous scorecard-specific applications, and business intelligence tools used to track Balanced Scorecards. Aside from pen and paper, there are pros and cons to each one of them.